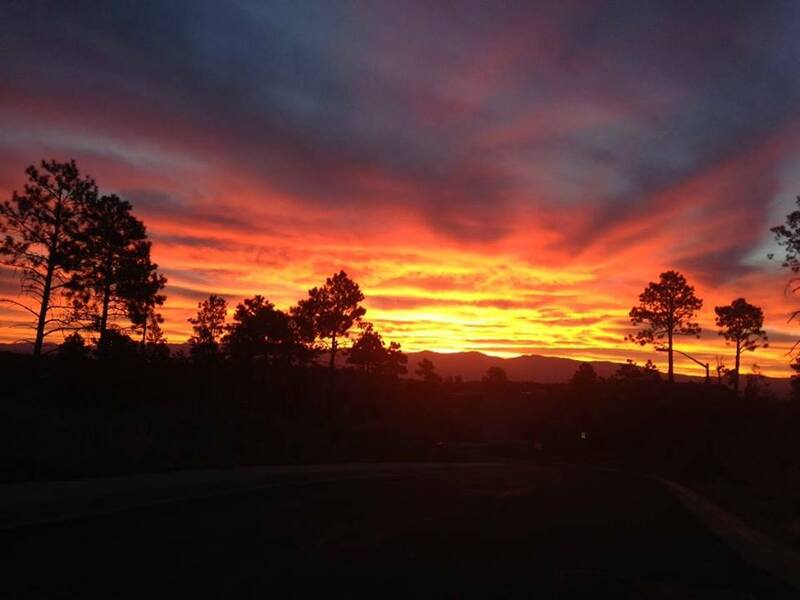 Sunrise in Los Alamos, New Mexico a few weeks before the running of the Jemez Mountain Trail Runs. The May 23rd running of the Jemez Mountain Trail Runs marks the 10th anniversary of a wonderful group of trail runs hosted by the High Altitude Athletics Club and staffed by a most enthusiastic group of volunteers. 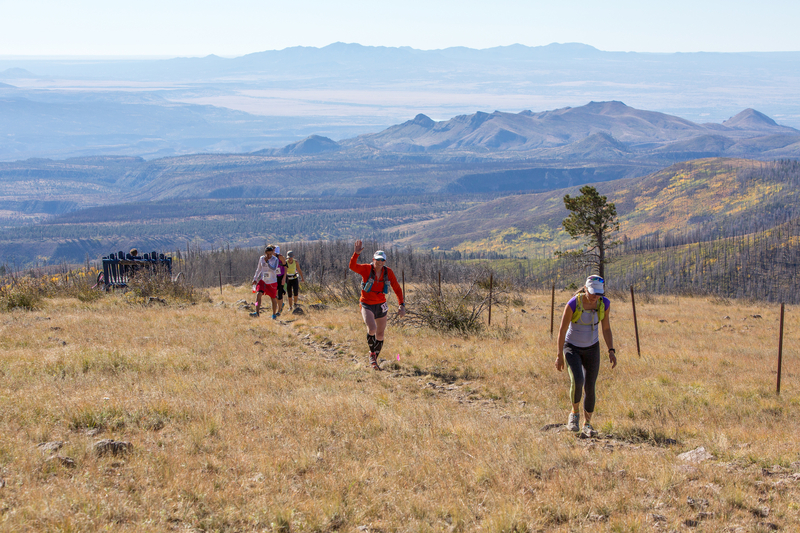 50 miles, 50 km, and a very “heavy” ½ marathon bring 600 runners to be challenged by steep climbs and descents traveling along the volcanic ruins of a magnificent caldera complex around Los Alamos, New Mexico. In the decade since the event was conceived as a modest local ultra event, much has changed in the world of long distance trail running; but the original goal of the JMTR – celebrating the joy of running in the mountains, is very much in evidence in Los Alamos in late May 2015. Los Alamos has always been a unique community. It is best known as the home of Los Alamos National Laboratory (and indeed the community would not exist without the Lab), and has a high concentration of world class scientists and engineers; however, there are other national laboratories spread across the country, and it fair to say that in many ways the residents of Los Alamos are rather different. I grew up in Los Alamos, went away to be an academic for two decades, and had the privilege to return 13 years ago and work at the Lab. There is a character to the town and it’s residents — lab employees or not — that embraces the rural mountain lifestyle. People here love the outdoors and in general, they are likely to run, bike, hike, camp, hunt, swim, ski – most anything that celebrates nature. The Jemez Mountain Trail Run is a good example of this romance. The German website Deutsche Ultramarathon Verengung (DUV) tracks statistics for ultra trail runs, and although there is no doubt that some races are missed, it is a good measure of worldwide ultra (50 km races and beyond) participation. In 2014, 34,954 Americans (unique names) ran in ultras. There are 200 million adults in the US (between ages of 18 and 65); assuming all adults could run an ultra, only .0175 percent of this population choses to do so. The adult population of Los Alamos is approximately 12,000, which would imply that if the town was “like” the rest of the US, then about 2 of the residents would run an ultra. 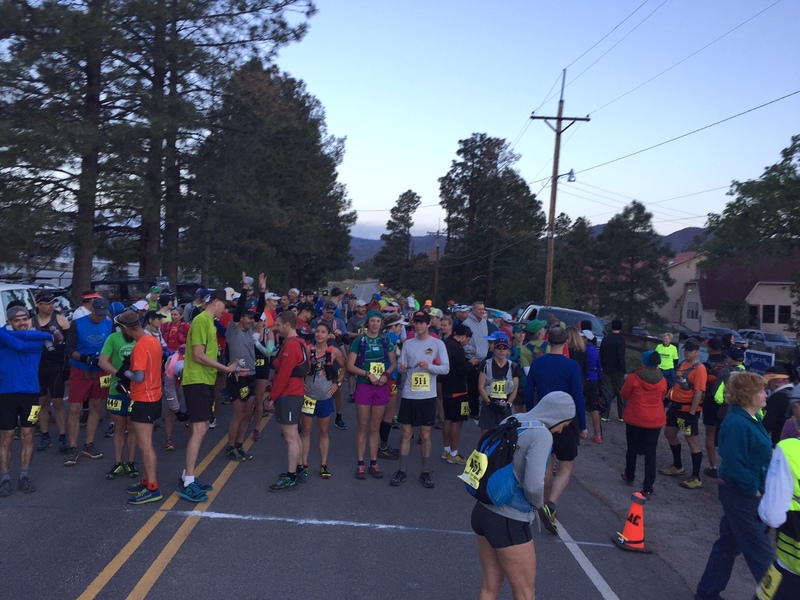 In fact, in 2014, 49 Los Alamos residents ran at least one ultra — DUV and Ultrasign report that Los Alamos residents ran no less than 71 ultras, including 5 or 6 runners that entered and finished 100 mile races. Applying bulk statistics is always fraught with danger, but it is clear that there is much Jemez love for being on the trail for long periods of time! 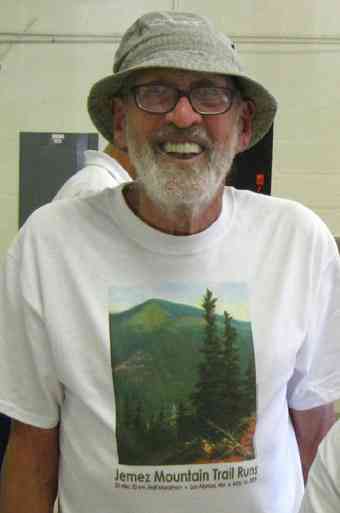 Aaron Goldman, the force behind the original Jemez Mountain Trail Run in 2006. Photo from Sue Norwood, at the pre-race dinner in 2009. Goldman passed away a short time before the 2010 JMTR. In 2006 Aaron Goldman, a Los Alamos ultrarunner (and extraordinary humanitarian) called a friend Kristen Kern (coincidentally, the race director of the Valles Caldera Runs) and broached the idea of running a trail-based ultra. There had always been a strong running community in the town, but access policies to land and roads adjacent to the 40 square miles of Los Alamos National Laboratory changed dramatically after 9/11. This eventually spelled the end of long road races, and Goldman wanted to revive the racing scene on the spectacular trails in the adjacent Santa Fe National Forest. Aaron and Kris thought about a 50 miler, a marathon and a long-distance relay race. The marathon eventually morphed into a 50 km ultra, and the relay was dropped for logistic reasons (relay runners would actually have to travel further to their hand-off stations than they would actually run). Goldman expected about 20 or 30 runners total – when he had an interview with the local newspaper to drum up support he stated “any weekend jogger can run our 50 mile course”. The original race was successful beyond all hopes – about 100 runners started, although only 50 finished (apparently the non-finishers had not been jogging on weekends enough). The next year there were two hundred runners, and the JMTR became a fixture. The JMTR 50k course (made in 2014, so there are minor variations in 2015). The course starts and ends at the Posse Shack, on North Mesa in Los Alamos. The low point is at mile 9 at the bottom of Los Alamos Canyon, and the high point is at mile 17 on the top of Pajarito Mountain. Click on figure to make full size. The course for the various races has changed a number of times over the decade. The 2011 Las Conchas fire devastated much of the high country in the eastern reaches of the Jemez Mountains, and later trail improvements by the Forest Service made for an improved pathway, but the theme has always been “a couple of long steep climbs, and spending time above 10,000 elevation”. The run(s) are wonderful because of the courses, but the most amazing feature of the JMTR are the volunteers. A core group of more than a dozen work year long on the event, but as the the third saturday in May approaches dozens more join in; seems there are at least a hundred enthusiastic volunteers on race day manning the aid stations, coordinating the tracking of the runners and providing first aid, staging the best ultra party at the end, and making sure that JMTR is an ultra to remember. I am both both happy running, and proud of my community as I prepare to slog the 33 miles from the Pajarito Plateau to Pajarito Mountain, and race down Guaje Ridge. I have run the JMTR 50 km several times, and I run the trails that comprise the course pretty much every week. I would not rank the course as overly difficult, although it is challenging. However, most of the people that come to run the JMTR are from outside New Mexico (Texas and Colorado are state most commonly represented), and many are from home bases that are at a much lower elevation. In addition, informal surveys of the runners indicate that 15 to 25 percent identify the JMTR as their first trail ultra. In fact, this year my wife (who is an outstanding marathoner) and two colleagues from the Washington DC area ran the JMTR as their first trail ultra. Elites and runners that routinely race in the Rockies don’t need any advice on the JMTR. However, there are some simple things to be aware of if you are coming from lower elevation, or are a novice distance trail runner. The single biggest issue is attitude – the race starts at an elevation of 7280′ and has a short dip down to 7190′ in Los Alamos Canyon, and tops out at 10,440′ on Pajarito Mountain. The average elevation during the 50k is about 9100 feet (the average is determined by time spent running the different sections of the courses – the steep, high elevation climbs take a couple of hours for most runners). 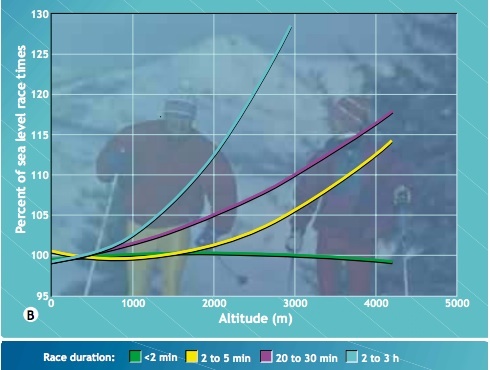 Altitude zones, and the reduction of atmospheric pressure (and available oxygen) as a function of elevation. The largest environmental factor limiting human performance is access to oxygen. Over the range of athletic performance (from sea level to the top of Mt. Everest) the percentage of the atmosphere that is oxygen is constant (about 20% of atmosphere is O2); however, the amount of the atmosphere decreases rapidly with elevation. At sea level the pressure of the atmosphere by definition is 1 atm. 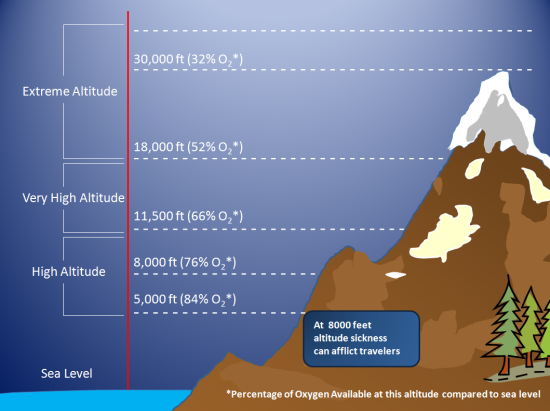 Climb to 8000 feet and the atmospheric pressure decreases to about 3/4 of that at sea level, and thus the available O2 decreases the same amount. The effects of decreasing O2 pressures have been studied extensively – especially after the 1968 Mexico City Olympics. Although many world records were established in events like the high jump, NO records were recorded in “endurance” events at Mexico City. Coincidentally, the elevation of Mexico City is nearly identical to the starting line of the JMTR. 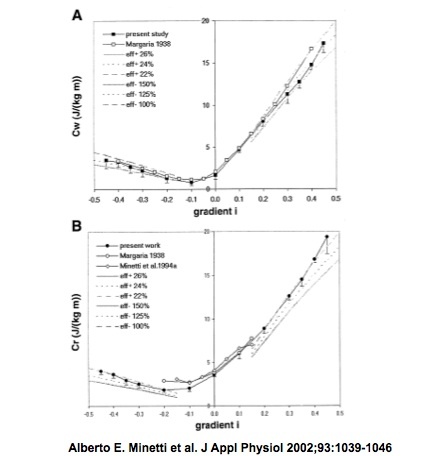 The figure below shows a generalization of performance based on the duration of a particular event. For all runners of the JMTR the expectation is that oxygen debt will translate to a race time that is somewhere between 15 and 25 percent slower than if the JMTR was run in Orlando, Florida. That is a huge difference, and there is no way to “change” that value. Arrival a day or two in Los Alamos before the JTMR will allow acclimatization so some high altitude effects (like dehydration), but it has nearly zero effect on athletic performance. It typically takes 6 weeks to adjust endurance performance, and even then the high altitude performance will be significantly reduced from expected sea level performance. I routinely visit Washington DC at least twice an month, and I have a standard running workout that allows me to compare this elevation effect. I run a flat 6 miles with intervals; in Los Alamos my overall pace is about 10:20/mile, and in DC it is 9:00/mile. No fooling mother nature! This does not really make the JMTR “harder” than sea level ultras, just slower. Expect slow, and accept the joy of running high. Generalized athletic performance as a function of elevation (from xxxx, 1998). Click on figure to see a larger version. Very short duration races – like the 100 m dash – benefit from the lower air pressures by reducing drag. However, long duration events – like an ultra run – see performance degradation due to lack of oxygen. There are other effects of elevation in addition to lower oxygen pressures. The lower atmospheric pressures mean lower water content also — relative humidity is not a great comparison between sea level and Los Alamos because it takes much less water content to saturate the high altitude atmosphere. 25% relative humidity in Los Alamos translates to the water content of a relative humidity of about 15% at sea level. In addition, the higher elevation means lower temperatures, which additionally reduces the ability of the atmosphere to “hold” water. It is a certainty that when you run the JMTR every expelled breath will contain much more water than the return inhaled breath. The dry air has the advantage that sweat evaporates quickly, and it is easier to stay cool. However, this also leads to dehydration – drink much more that you are use to! Another effect of altitude is the intensity of UV radiation, the cause of sunburn. The strength of UV radiation is directly proportional to the amount of atmosphere the photons pass through (UV is mostly absorbed by ozone). The UV index is a standardized scale that relates UV intensity to “time to sunburn” for an fair-skinned person (the scale was invented in Canada, where fair skin = alabaster). On a clear, sunny day the UV index at sea level might be a value of 8 — at 9000 feet a similar sunny day would have a UV value of 12. The value of 12 translates to expected sunburn within 10 minutes for unprotected and exposed skin. Sun screen is a must for the JMTR! The energy cost of climbing a hill — both running and walking. The final challenge of the JMTR is the steep climbs – and to some extent, the fast descents. The figure above shows the energy cost for climbing a hill (the y axis is Joules per kg-minute, and x axis is the gradient, as measured in feet climbed divided by horizontal feet traveled). The graph shows two sets of curves – one for walking (Cw) and one for running (Cr). The biomechanics of running and walking are different, and the energy cost of running is higher – it takes twice as many calories to run a minute as it does to walk a minute. A gradient of 20 percent (~climbing 1000 feet in a mile) takes twice as much energy as compared to running a flat course. Between mile 13 and 17 on the JMTR the gradient is approximately 10 percent, and the energy penalty is 50%! This will tire even seasoned runners. Although relative penalty for walking is about the same (50%), the energy used while walking is much lower, and therefore, walking some or most of this this long ascent of Pajarito Mountain will significantly increase your energy reserve for running the last section of the JMTR. By the way, there is a slight energy penalty associated with running downhill also due to the pounding motion on the legs. However, this is small – the body is most efficient running down a 10% grade. I have much experience in walking the race course to the top of Pajarito Mountain – over a dozen races along this course has taught me that power walking a few miles improves my overall race time significantly. Picture from the 2014 Pajarito Trail Fest on a beautiful fall day. All the best advice for running any ultra can only go so far. On race day many factors – health, sleep, injuries, etc. will actually determine the outcome. I was reminded of this lesson this year – flu like symptoms and dehydration forced me to drop the JMTR at the 18.2 mile point. It was my first DNF in an ultra, but it was clear that my body was not in tune with my hopes! All ultras are a struggle, and runners go through physical and mental cycles of feeling well. Sometimes the troughs are deeper than the crests. The starting and ending point for the JMTR is a historical log-cabin known as the “Posse Shack”. 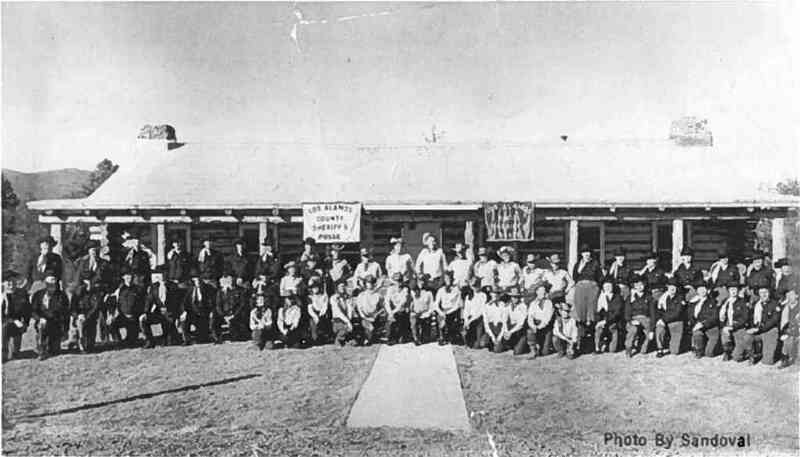 The Los Alamos Sheriff’s Posse – a group of equestrian enthusiasts for the most part – built the shack as a meeting place and social center in 1958. The Posse Shack is located on North Mesa (although many locals call it “Horse Mesa” because of the stables), one of a dozen mesas that make up the Pajarito Plateau. The mesa is an erosional remanent and is composed of Bandelier Tuff – volcanic ash that was erupted in two mega eruptions about 1.4 million years before the present from volcanic vents that were above the Valles Caldera. The tuff was laid down as a hot ash cloud, and “welded” by internal heat. Despite the moniker of welded tuff, the rock is quite soft, and easily eroded. The course takes off due east and then drops into Bayo Canyon, and runners, hikers and horse riders of the past have carved a narrow track in the tuff. The Posse Shack, shortly after it open 57 years ago. The modest building still serves as a gathering point for events in Los Alamos. It has been an unusual spring in Los Alamos, and for five weeks in a row before race there has been snow and rain on the town. This moisture is most welcome even if it generated endless discussion about the consequences for the JMTR. Last year (2014) a noon time snow squall ended up chasing a hundred runners off the course. However, this year the weather is perfect at race time – the temperature was 47 degrees, and there was almost no chance of rain. I awoke at 4:00 am, but had a heart rate of 41 beats per minute. I would love to claim that this was due to extraordinary conditioning, but alas, this low heart rate means that the lack of a thyroid is “acting up”. I fixed the heart rate by downing several cups of strong coffee – got it up to 50 by race time, but knew running 50 k was going to be difficult. 2015 has been a tough year physically for me, and the latest challenge started as a toothache about 4 weeks before the JMTR. 10 days before the race it degenerated into a full blown abscess, and I awoke to a swollen face that caused one of my eyes to be shut. The swelling was remedied by a regiment of penicillin, and after a week (3 days before the race) my face was normal, and the tooth(s) although dead did not bother me. However, the penicillin also killed all the useful bacteria in my digestive track. I knew that there was a chance of dehydration during the run because of digestive issues (that is a “delicate” euphemism), but prepared for the long run. Starting line at 5:50 am, May 23, 2015. Note that the white chalk line is more like a gathering point than anything else. The start of the 50 k is always strange. The race director and staff are mellow, and the “ready, set, go” is decidedly informal. However, once the start is announced the runners sprint away. Sprint! There is 33+ miles to cover and thousands of feet to climb, but the emotion of the start catches up even the most jaded runner. I always resist the urge to sprint – for about 10 seconds, and then I am stampeding with everyone else. As the course dips down into Bayo Canyon I always feel like a lemming that follows the pack to certain doom. The start of the 50 km race is always crazy. 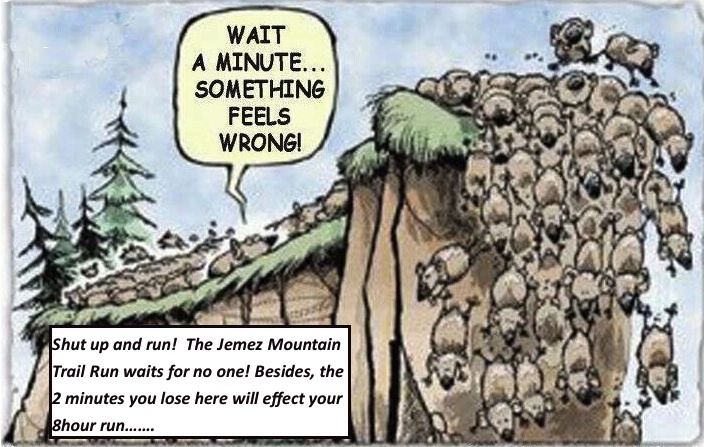 It very much reminds me of lemmings running as fast as they can off a cliff – no return! The first five miles of the run is deceptively easy, and although the there is some steady climbing it is pretty easy to roll into the first aid station in under an hour. Of course, the fastest runners have past the aid station in 45 minutes or less, so the field of runners is spread out. I arrive at the aid station at 55 minutes, but I am not feeling great. Fortunately, for the next 10 miles or so I have great company and discuss everything from basketball to lab politics. Mile 9 really defines the beginning of the JMTR – that is the low point elevation wise in Los Alamos Canyon. Over the next 9 miles the climb is steady and unrelenting. Conversation makes the miles seem pretty easy, and we arrive at Aid Station 2 (10.2 miles) about 2hrs and 15 minutes from the start. That time is 10 minutes slower than I have ever covered on this course, but does not seem alarming yet. Right before the aid station there is a very tough climb – short, but steep. 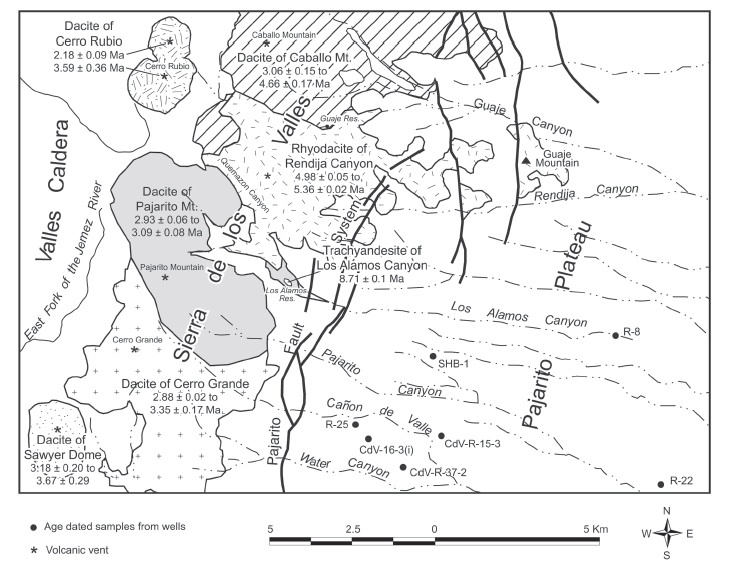 It is associated with the scarp of the Pajarito Fault. The fault is related to the Rio Grande Rift and has been active (at least in a geologic sense) for at least 5 my. The offset of the Bandelier Tuff approaching the aid station is 100m. This short climb sends alarm bells off in my head about my state of health. Once Aid Station 2 is passed, the trail is out of the Bandelier Tuff, and the rocks become much harder and angular. For the next 8 miles the geology is dominated by grey dacite – there are little white flecks of plagioclase, and sometimes you can find tiny biotite crystals. Today the rocks just seemed grey. The dacite was not formed by a massive eruption, but by a series of lava flows and injections of dikes. The map above shows the Pajarito Mountain Dacite, and the surprising location of a 3 million year old vent that extruded the dacite. Yes, Pajarito Mountain is an ancient volcanic vent, and that vent is located just east of high point of the JMTR. Although I am feeling punkish, we are making pretty good time on the trail. By mile 14 we still only 10 minutes off my typical pace. However, I have to get off the trail fast here – I urge my companions on, and by the time I am able to resume the run I am far behind. Unfortunately, no amount of water drinking can cure the stomach maladies that now have me in their firm grip. By the time I top out near Pajarito Mountain, I have no real control over my body. I usually love the run from the mountain top down to the ski lodge – a drop of 1200 feet in 1.3 miles – today I am limited to a slow trot. I make it to the ski lodge in 5 hours, but I make the very painful decision that I have to drop, and declare a “Did Not Finish”. Only 18 miles covered on the 10th Anniversary JMTR. Bummer. However, the incredible volunteers at the ski lodge aid station have me pseudo hydrated soon after I drop, and arrange a ride for me back to the Posse Shack. The JMTR was a great event despite my pitiful journey. I was most fortunate to have a couple of guests in my home that traveled from Washington DC to race in the JMTR. BethAnn Telford is an amazing and inspriational woman – she was diagnosed with brain cancer in the Winter of 2005 and has dedicated her life to raising awareness of the illness and constantly inspiring others that suffer from this killer. BethAnn is an amazing runner and came out to experience the JMTR as training for a Rim-2-Rim run this October to highlight HOPE that no disease should stop the joy of life. With BethAnn was a young woman, Sarah Domnarski, that is a running partner. My wife ran with BethAnn and Sarah for their first ultra, and they were far more successful than I. 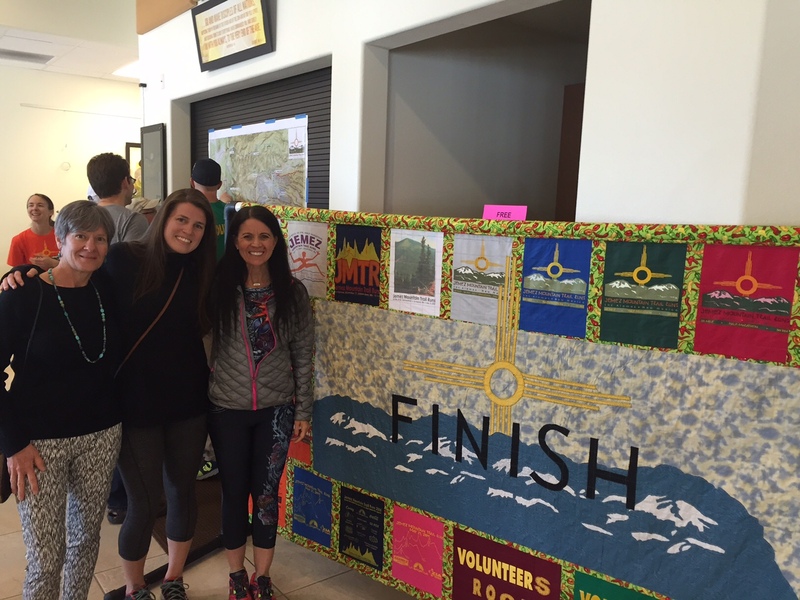 The HOPE team at standing in front of the JMTR quilt honoring ten years of running in Los Alamos Mountains. From left, Michelle Hall, Sarah Domnarski, and BethAnn Telford.